I’m a longtime fan of cosmic disaster scenarios. Not because I’m particularly gloomy (according to my friends and family, I’m actually more of a goof), but because they are fabulous ways to illustrate the workings of the universe. They are also great for making you appreciate the delicate set of contingencies that allow us to exist right now, right here on Earth. I wrote one of the first Armageddon-science articles, entitled “20 Ways the World Could End,” which was published for the 20th anniversary of this magazine, and followed it with a sequel a decade later. Some potential cosmic catastrophes are modest enough that we could potentially avert them–an asteroid on an Earth-collision path being a prime example. Some of the scenarios are so unlikely that they are hardly worth considering–for instance, a stellar-mass black hole barreling straight toward our solar system. But there’s one disaster that falls into the sweet spot. It’s something that we know has happened in the past, possibly with significant impact on our planet, and there’s nothing we can do to prevent the next one. I’m talking about a nearby supernova (and mindful, too, that “disaster” literally means “bad star”). Fortunately (or unfortunately, if you are hoping for some really exciting destruction), our Sun will not, can not ever explode as a supernova. It’s simply not massive enough. No nearby star is a supernova candidate either–not surprising, since stars massive enough to go supernova are few and far between. The closest likely candidates are two bright red stars that are both prominent in the sky, and that are both coincidentally rather similar in distance: Antares in the constellation Scorpius and Betelgeuse in Orion. Of the two, Betelgeuse is more intriguing. It is somewhat larger, more massive, more menacing. Really, it’s huge–see above. It has inspired a lot of astronomical scare-stories as a relatively nearby red giant star that is expected to explode soon as a powerful supernova. (The movie Beetlejuice undoubtedly helped raise its profile as well.) When it explodes, it could reach a brightness in our sky of about magnitude -11. That’s about as bright as the Moon on a typical night, bright enough to cast dramatic shadows, bright enough to see clearly in the middle of the day. Surely that would do some nasty stuff to us, right? But there is a reason that our planet has not been destroyed yet, despite having loitered around the galaxy for some 4.5 billion years. What the Betelgeuse-scare stories often gloss over is that “nearby” and “soon” are relative terms. The way astronomers use them is quite different from the way we use those words in everyday conversation. As soon as we pick apart that term “soon,” the situation starts to look less dire. Astronomers estimate that Betelgeuse is approximately 10 million years old, and it began expanding into a red giant 40,000 years ago. That means it has begun nuclear fusion of helium in its core, creating oxygen and carbon and starting down the pathway to core collapse and eventual supernova detonation. Exactly how long it will take for that full process to happen is unknown; researchers can make only approximate estimates using models of stellar evolution. Those models, in turn, depend on Betelgeuse’s mass and rotation period, both of which are imprecisely known. If Betelgeuse is almost 20 times as massive as the Sun, as most studies indicate, then it will explode sometime within the next 100,000 years, leaving a celestial splatter similar to Cassiopeia A, shown above. It’s more likely to blow up later in that time-frame, but it’s not impossible that it could explode tomorrow. Still, even if you assume that an explosion could happen randomly any time within that period (which will probably overstate the near-term probability), the odds of Betelgeuse exploding in your lifetime are less than 0.1%. Then again, if Betelgeuse is closer to 15 times the mass of the Sun, as implied by a few other studies, and if it is rotating slowly, then it could take a million years or more to go supernova. In that case, the likelihood that you will live to see Betelgeuse go boom is a good, solid zero. Time to go back to worrying about asteroids and all of the bad things we humans are inflicting on ourselves. 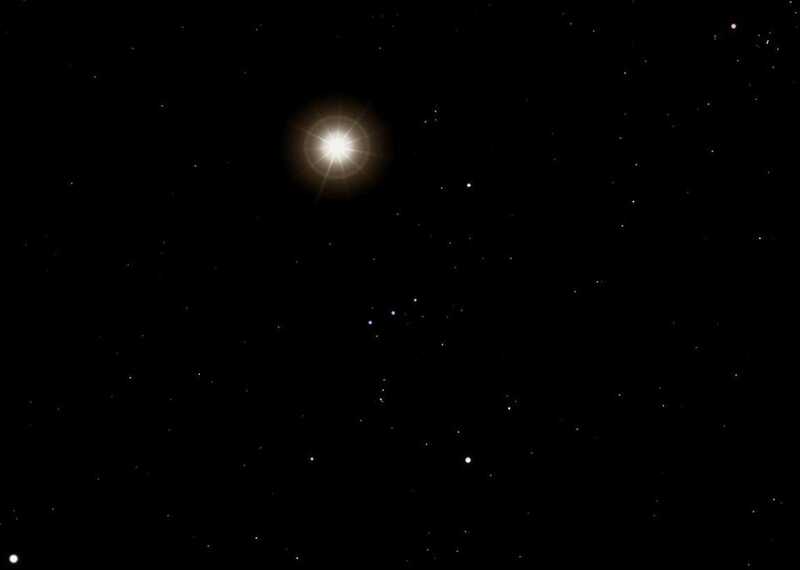 Now, let’s look at that other term, “close.” It’s not so easy to measure the distance to a bright red giant star like Betelgeuse. Different methods give answers ranging from 520 light years to nearly 700 light years. That’s about 150 times as far away as Alpha Centauri, the nearest star system. Even at the low end of the distance estimates, Betelgeuse is too far away to do significant damage to Earth. Material ejected by the Betelgeuse supernova will have expanded and cooled to insignificance long before it reaches Earth. Radiation from the Betelgeuse supernova will certainly have some measurable effects on Earth’s environment, but probably only a minor impact on life. Betelgeuse is too far away to significantly ionize Earth’s atmosphere and strip away its ozone layer, for instance. Don’t get me wrong, it will be spectacular (as illustrated below by Henrykus/Celestia), but probably not deadly. A great way to evaluate the risk is to look at the consequences of past nearby supernovas. It’s not easy to find evidence of them (which itself is a strong indication that they don’t pose much of a threat), although one recent study claims to find chemical evidence of two supernova explosions between 1.7 million and 3.2 million years ago. These explosions allegedly happened on the order of 300 light years from Earth, meaning they hit us with radiation 4 times as strong (give or take) as what we’d expect from Betelgeuse. There’s no clear sign that they had any effect on life, however. It’s possible they caused a period of climate cooling, but it’s also possible that the changing climate was completely unrelated. At any rate, there was no mass extinction during that era. Last November, a team led by Adrian Melott at the University of Kansas put together a more frightening interpretation on the data. They date the ancient supernova to about 2.6 million years ago, and suggest that it might have coincided with the Pliocene-Pleistocene extinction, an intense die-off of marine species that occurred right around that time. Melott hypothesizes that muon radiation from the supernova led to intense cancer rates that wiped out many large marine animals. One of the species that vanished was the infamous Megalodon. The headline practically writes itself: Nearby Supernova Slayed Megalodon with Blast of Cancer-Rays. The problem is, the evidence that a supernova had anything to do with this extinction is fairly thin, and the link is viewed with skepticism by many other researchers. On the other hand, the geochemical evidence for the supernova itself is quite strong. A star almost certainly did pop off relatively nearby about 3 million years ago. Statistically speaking, that’s not surprising: On average, supernova explosions should occur within 100 parsecs (300ish light years) every 2 million–4 million years. Life on Earth must have weathered a great number of such events. It’s safe too say that even if Betelgeuse were to explode really soon, in your lifetime, life would survive this time around as well. Over the past 4 billion years, though, some supernovas must have gone off much closer than that. It’s quite possible that some of those did have serious consequences for life on Earth, triggering mutations and extinctions that shaped the course of evolution. The connection between life and supernovas goes even deeper, however. According to one popular theory, the shock wave from a supernova triggered the formation of our solar system; and most of the heavy elements on our planet (and in our bodies) quite certainly originated in exploding stars. Supernovas might bring death, but they definitely brought life. See what I mean? Disaster scenarios don’t have to be gloomy after all. If you look at the shape of galaxies it looks to my eye that something was traveling extremely fast and caused a type of “cosmic boom” causing the residual energy to condense forming the stars and planets and suspect that blackholes of similar galaxies line up(did at one point) to one another in the trajectory of say an electron. A.I. will more than likely form a model of the universe where it can connect every galaxy’s formation with “dark matter” speeding like an electron creating matter as it intersects a sort of wave front. Regardless the “Big Bang Theory” will be replaced by the “Cosmic Booms Theory” at least fleetingly. One of the fun things about discussing cosmic events: You always have to specify which “now” you are talking about! In the “frightening interpretation” article, it is mentioned that the supernova light was visible in the sky and then after 100ish years the radiation reached earth. How is it possible that light reached earth before radiation even if both travels at the same speed ? In the model proposed by Adiran Melott, the blast from the supernova creates shock waves in the surrounding gas; those shock waves then create high-speed cosmic rays (subatomic particles) that would eventually reach Earth and cause muon showers. Light from the supernova would travel directly to Earth. The cosmic ray mechanism is delayed because it takes time for the physical blast to hit the surrounding material, and then the resulting cosmic rays do not quite reach the speed of light. That accounts for the predicted lag of a few centuries. It’s also been speculated that when really large stars go supernova and their cores collapse, jets from the poles of the stars shoot out with much more energy than the rest of the blast wave. Any planet caught directly in one of these beams within a few hundred years of the supernova would likely be sterilized by the gamma rays. Some astronomers have suggested that at least a portion of the distant extragalactic gamma ray bursts we detect on earth are from alignments with the poles of very distant stars exploding. Luckily, Betelgeuse does not seem to be lined up with either pole pointing in our direction. If a supernova 2.6 million years ago caused a major die-off of marine species why didn’t it affect land species the same way?